In March, an hi-def port of Perfect Dark will be released on Xbox LIVE Arcade. The port will feature much more than tarted up graphics. 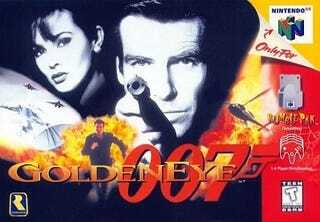 Ken Lobb from Microsoft Game Studios has told Kotaku at DICE 2010 that players can use weapons from Nintendo 64 game GoldenEye 007. That game was developed by Rare, the same studio behind Perfect Dark, which has been called GoldenEye's "spiritual successor". GoldenEye 007-style weapons were also unlockable in Perfect Dark, but with slightly different names. Lobb also confirmed to Kotaku that the upcoming Perfect Dark port will feature GoldenEye levels in the multiplayer. Facility, Temple and Complex, the GoldenEye levels that were in the original Perfect Dark have made the jump to the XBLA version as well.